16 p. : 27 cm. "Lee A. 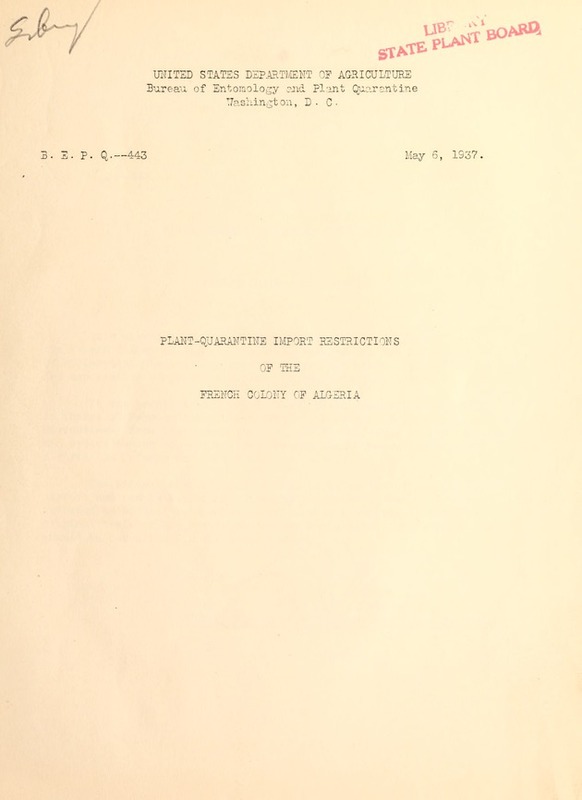 Strong, Chief, Bureau of Entomology and Plant Quarantine"--Prelim. p.
B. E. P. Q.--443 :.I?.y 6, 1937.
the exportation of plants and plant products to that Colony. Algeria (La Defense des Cultures). should be consulted for the exact texts. of the Colony of Algeria. provisions by other orders aend decisions. after special] authorization by the Governor-General. Aul-.caspis pentagona Targ.). Certain exceptions are provided for. And. and And. ), and the ink disease (Blepharospora cambivora Petri). perniciosus Comst.) occurs: Importation and transit prohibited. tion of origin which may be made by the bearer. (Letter No. 1922.) Exception is made of flowers of Italian origin. nish the above-mentioned documents within one month. in conformity with the provisions of the order of May 7, 1934.
be imported if accompanied by a phytosanitary certificate. gloveri Pack. ), and Ceroplastes sinensis Del Guer. (Decree of Jan.
lished by an order annually. packed in clean containers that arc in good condition. tion by the General Government. admitted unless shipped between September 25 and May 15.
if contaminated by any of the parasites mentioned in special orders. free from the parasites declared dangerous to the cultures of the Colony. opened at the expense and risk of the consignee or holder. 4. The name and address of the consignee. balls of earth ?hvll be tightly wrapped. Arts. 6 to 12. Distribution of imported plants in the Colony. Art. 13. Exportation of plants from Algeria. Bacteri'um citri (Hasse) Doidge, citrus canker. Cuscuta arabica var. aegyptica Engelm., dodder. Endothia parasitica (Murr.) And. and And., chestnut bark disease. Synchytrium endobioticum (Schilb.) Perc., potato wart. (Aleurodes) Dialeurodes citri Ashm., citrus whitefly. Anthonomus rand is Boh., boll weevil. Anthonomus vestitus Boh., cotton-square weevil. Aspidiotus perniciosus Comst., San Jose scale. (Diasp is) Aulacaspis pentagon Targ., white peach scale. (Doryph-ra Len--ti-no-tarsa deccmlineata Say, Colorado potato beetle. Icerya purchasi Mask., cottony-cushion scale. Iridomyrmaex humilis .Myr., Argentine ant. (LepidosaPhes) Mytilaspis gloveri Pack., Glover's scale. ing that the potatoes originated in that country. at the expense of the importers. Jan. 17, 1933.) Seed potatoes are admitted from Great Britain. place infected with potato wart. **Biffer les deux mentions qui ne s'appliquent pas. of San Jose scale has been determined. dangerous parasites, especially San Jose scale. to France and Algeria. An authorization in advance is no longer required. cating the place of production. invoice or a shipper's declaration. cases, barrels, sacks, cartons, or other similar containers. Alger, Bone, Bougie, Lh1ustaganem, Oran, and Philippeville. birdsfoot trefoil (Lotus corniculatus); and timothy (Phleum pratense). established by the Order of the Governor-General of October 25, 1922.
cal species of the declared seeds. portion of at least 5 percent to disclose their foreign origin. by a method approved by the Minister of A.:riculture. under customs supervision at the expense of the interested persons.